The Seward Highway is one of the most scenic highways in the country. It has been designated a National Scenic Byway by the US Department of Transportation and carries you 126 spectacular miles south from Anchorage to Seward, Alaska through awe-inspiring mountain vistas. Give yourself at least 2 ½ hours to make the trip, longer if you want to take pictures of the remarkable views along the way. Not interested in driving yourself? 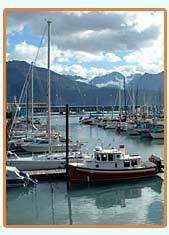 Seward can also be reached by train via the Alaska Railroad or by ferry via the Alaska Marine Highway System. Known as the “Gateway to the Kenai Fjords National Park”, Seward is situated at the head of Resurrection Bay on the Kenai Peninsula. 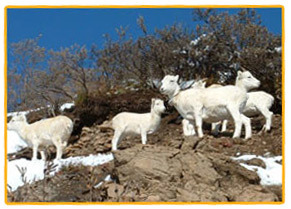 It has a population of 4,000 with numbers reaching 10,000 during the summer months. In addition to excellent sport fishing for halibut, silver salmon, and various species of rockfish, the area offers multiple opportunities for fun and adventure for non-fishers as well. 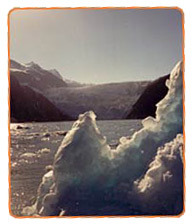 Other ocean-going activities you might enjoy include glacier and wildlife cruises, kayaking, and sailing. For the land lubbers in the group, Seward also offers summer sled dog rides (including with the team of 2004 and 2013 Iditarod Sled Dog Race Champion, Seward’s Mitch Seavey) and numerous hiking trails, ranging from the short, easy walk to the face of Exit Glacier to the strenuous course up the 3022-foot Mount Marathon, site of a well-known annual July 4th race. Seward is home to the Alaska SeaLife Center, a renowned world-class sea life research and rehabilitation center and a must-see destination for anyone visiting Seward. The center allows an interactive and personal exposure to a number of species of marine life, including Steller sea lions, harbor seals, octopus, and sea birds, including puffins. The Seward Museum highlights the town’s 100-year history, including information about the 1964 Good Friday earthquake and subsequent tsunami, which did tremendous damage to the area and killed several residents. 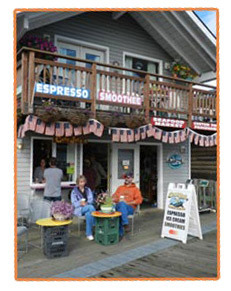 Seward also offers many gift shops with unique, one-of-a-kind treasures, many with marine and nautical themes. Seafood is the highlight at several local restaurants, with fish fresh off the hook. One downtown restaurant will even cook up your catch for you.